Spray-on cleaner, shiner and finger mark protector. 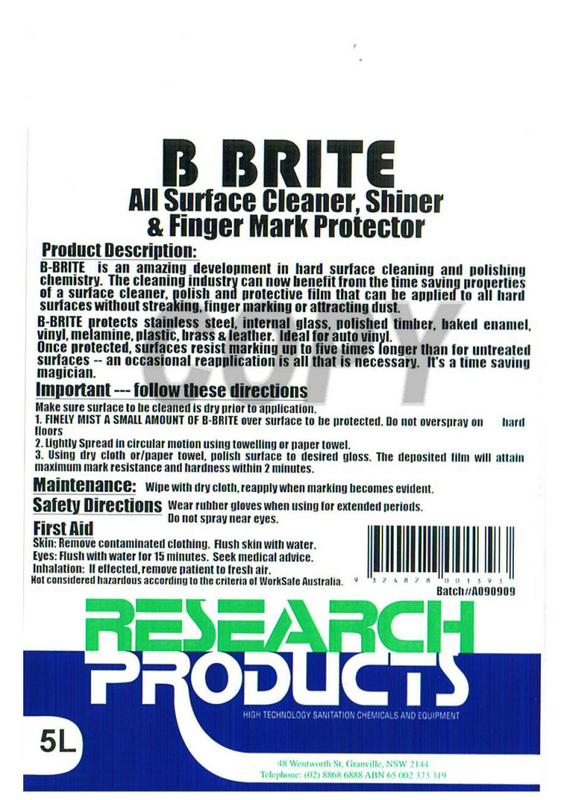 B Brite Cleaner and Polishers protects, cleans and polishes Glass, Chrome, and Polished Timber, Stainless Steel, Formica, Painted and Vitreous Surfaces. 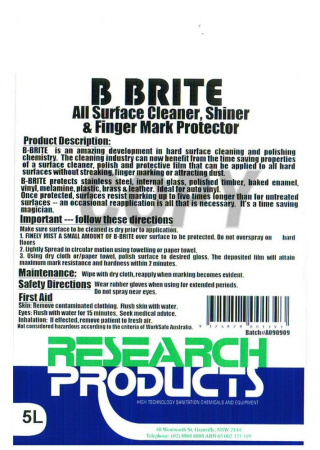 B-Brite has been developed as an all-in-one cleaner, polish, mark and dust protector for nearly all surfaces. B-Brites’ Lemon Oil Fragrance gives all surfaces a clean as a whistle fresh aroma, as you dust and polish. Internal Glass, Sinks wash basins, Polished Timber, Mirrors, Stainless Steel, Elevators, Copper and Brass, Formica and Melamine, Fine Furniture, Porcelain, Painted Metal, Plastics, Stereo and Video Equipment, Shop Fixtures, you name it - B-Brite shines it.